This dress just makes us happy and reminds us of the ever-so stylish and classically modest Jackie Kennedy -- hence the name! Made with the loveliest fabric that is similar to linen without all the wrinkles, this fun polka dot dress is perfect for so many occasions. Belt included. Back zipper. 100% Polyester. No stretch. Love this sweet chic dress! Super cute!! High quality and ridiculously adorable! This was my first dress from Dainty Jewells. Absolutely love this dress. I love the classic print and style. Being a empire waist dress it fits perfectly over my baby bump and i will be able to wear it long after baby is born! The construction and fabric are very well made. The sleeves come below the elbow and the high neckline makes it perfect- no layering required fro modesty. I choose the maxi length which is perfect for me being 5'10. The dress is also fully lined making it so comfortable! Love, love , love this dress and will definitely be purchasing from Dainty Jewells in the future. What a beautiful dress with a vintage feel. Slip on some red heels with it and ooh-la-la!! It is fully lined. Order your regular size in Dainty Jewells. This dress was purchased for my daughter she writes: "This dress is extremely versatile! I love it so much that I am choosing to wear it for Easter. It is so very comfortable.... One of my all time favorite Dainty Jewell purchases. My sweet husband purchased this dress as a surprise for me. While I loved the overall style, I was a bit nervous that the waist would settle in the wrong place. It is perfect! Although I am short waisted, the waistline does not rest on my hips, but rather it lies in just the right place. 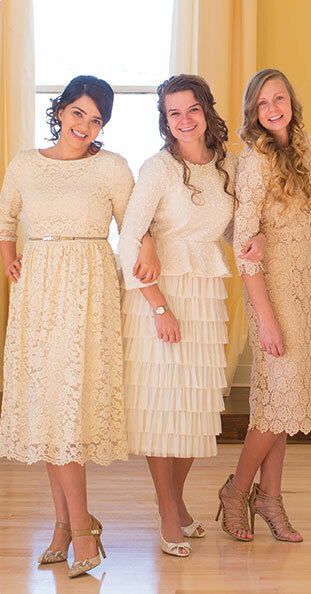 This dress is amazingly beautiful and it fits perfect in all ways .. very flattering and perfect for church . The material looks even better in person not cheap at all I love it ! I am so pleased to find Dainty Jewells. Finding modest clothes these days is a challenge. The dresses are very well made with high quality fabric. They are true to size. If you dont like to tight of a fit, I'd order a size up. Definitely will be ordering again.